Mold & Mildew Stain Remover quickly removes mold and mildew stains on grout. Penetrates problem areas almost instantly, leaving non-porous surfaces clean and mildew stain free. 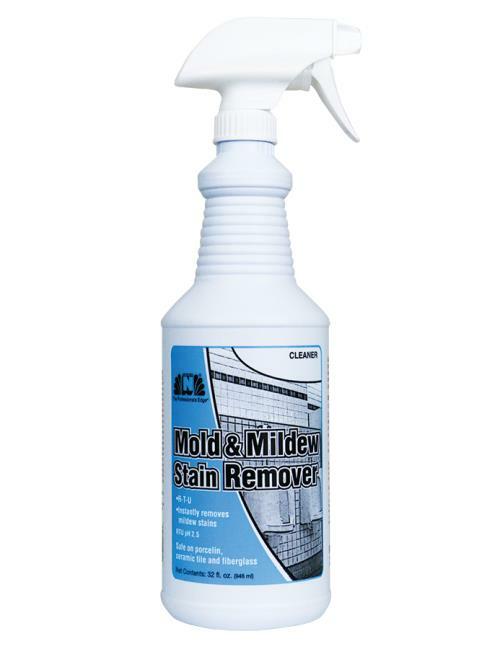 Mold & Mildew Stain Remover harnesses the cleaning power of an inhibited hydrochloric acid coupled with a surfactant to effectively lift mold stains and prevent their reoccurrence. With regular use Mold & Mildew Stain Remover will create an acidic environment which is not favorable for the growth of common mold species. Safe to use on porcelain, ceramic tile, and fiberglass. DIRECTIONS: Use in well ventilated areas. 1. Spray stained area with Mold & Mildew Stain Remover. 2. Agitate stained area with a brush and rinse thoroughly with water. 3. For more difficult stains, it may be necessary to repeat Steps 1 and 2. Note: Avoid prolonged contact with clothing, fabric, metals and painted surfaces. Eliminates: Mold stains, soap scum, dirt and hard water build-up. •Safe and user friendly . •Low VOC and does not create harmful fumes. •Pleasant, low impact odor for use in confined spaces. Could you imagine how beautiful and clean your bathroom would like without mold stains, soap scum, dirt, and hard water build-up? Click the link below to buy Mold & Mildew Stain Remover and make it a reality.